"The process is very simple. Just keep a picture of Lord Caitanya with His associates. 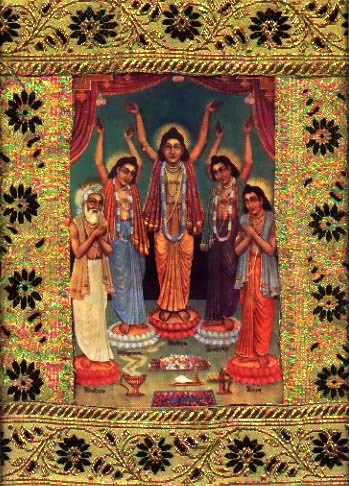 Lord Caitanya is in the middle, accompanied by His principal associates -- Nityananda, Advaita, Gadadhara, and Srivasa. One simply has to keep this picture. One can keep it anywhere. It is not that one has to come to us to see this picture. Anyone can have this picture in his home, chant this Hare Krishna mantra, and thus worship Lord Caitanya. That is the simple method. But who will capture this simple method? Those who have good brains. Without much bother, if one simply keeps a picture of Sri Caitanya Mahaprabhu at home and chants Hare Krishna, then one will realize God. Anyone can adopt this simple method. There is no expenditure, there is no tax, nor is there any need to build a very big church or temple. Anyone, anywhere, can sit down on the road or beneath a tree and chant the Hare Krishna mantra and worship God. Therefore it is a great opportunity. For example, in business or political life one sometimes finds a great opportunity. Those who are intelligent politicians take a good opportunity and make a success of it the first time it comes. Similarly, in this age, those who have sufficient intelligence take to this sankirtana movement, and they advance very quickly."